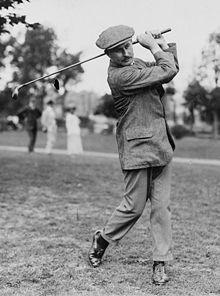 Harry Vardon (May 9, 1870 – March 20, 1937) was an English golfer and member of the fabled Great Triumvirate of the sport in his day, along with John Henry Taylor and James Braid. His natural talent, mental strength, and technical skill, gave him the tools to help him win 62 tournaments during his career. Among his wins are six Open Championships victories, and one U.S Open title; he was the first British golfer to win the U.S Open. One of the early pioneers of the game, Vardon was its first great star, whose overlapping grip has become the standard for virtually all professional and amateur golfers. Vardon also overcame putting woes in mid-career to win two of his British Open titles and his U. S. Open title. Harry Vardon was born in Grouville, Jersey, Channel Islands, to Philippe George Vardon and Elizabeth Augustine. He grew up with five brothers and two sisters, and was the fourth oldest of the boys. Harry did not grow up in a privileged background, and was a thin, frail youngster as a child. From a very young age, he loved sports and succeeded at Cricket, Football, and Golf. Although Harry would eventually be a golf star, his first ambition was to become a professional cricket player. When Harry was at the age of seven, a group of golf enthusiasts found a piece of land in Grouville, and developed a golf course. After facing some opposition from farmers, the group got a permit and named the course the Golf Inn, now the Royal Jersey Golf Club. Shortly after the introduction of the course, golfers from all over England came to play on the new links, and the people of his home town started to become interested in the sport. Harry became a caddy for the course, and soon after picked up the sport for himself. Since the course was off limits to caddys, Vardon and his friends found some vacant land and made a miniature course with four holes totaling around 50 yards each in distance. Not only did they make their own course, but because they lacked equipment, they made their own clubs. They used big white marbles for balls, which were about half the size of a regulation golf ball. For clubs, they cut branches off oak trees and trimmed the branch down so it looked like head of a driver. After practice, the kids became talented at making the golf clubs. When the oak heads began to wear and tear, they would use tin headed clubs, known as brassies. While the new invention elongated the life of the club, the rough surface produced calluses on the palms of the golfers' hands. One, perhaps apocryphal, theory of the invention of the famous "Vardon grip," with the bottom finger of the right hand overlapping the forefinger of the left hand is that it was created to avoid the pain caused by the tin. To make time to play at their course, the group had to play at night, and had heated stroke play match competitions under the stars. Later on, the youngsters found used golf balls on the course where they caddied, and took damaged clubs from club members. After repair, they would use the clubs for as long as they lasted, but they usually broke after a short amount of time. When the group got lucky, they were rewarded for their hard work with a undamaged club by a member of the club. At the age of 12, Harry was unhappy with school and wanted to help his family's limited means, so he left to work for a local farmer. He was a gardener for the man, and sometimes got the chance to play golf with him, after his employer gave him a set of old clubs. When Harry was 16, he joined a working-man's club and won the first prize at the event the same year. Even though his interest in golf was starting to intensify, the main reason he became so enthralled by the game was because of the success of his younger brother, Tom. His brother finished second in a golf tournament in Muselburgh, and entered a club-making shop at St. Anne's on the sea, propelling his older brother's interest. At the age of 20, Harry got a job as a greenskeeper at a new nine hole golf course in Ripton. Although he was content to stay in Jersey, his brother's influence led to him leaving home for the employment opportunity. After some time in Ripton, he moved on to another course in Bury, where he started to build his reputation as an excellent golfer. At the new course, several top golfers were members that could spread the word of the young Vardon's talent. Because of this Vardon arranged a match with Alexander Herd of Huddersfield, a 36-hole competition where 18 holes would be played on each man's home course. Harry was very nervous for his first professional match, and could hardly hold the clubs when he attempted a swing, resulting in a blowout loss. After the defeat, the young golfer was upset at his inability to stay calm during the match, and it forever changed his demeanor on the links. Although his first professional match was two years prior, Vardon's career really took off at age 23, when he entered the 1893 Open Championship at Preswick Golf Club in Scotland. He finished the tournament well off the leader board, but it was at his first Open Championship where he met many professional golfers and some of his closest friends. Shortly after the Open, he entered a small event at Ilkley Golf Club, the third oldest club in Yorkshire. After the event in Yorkshire, he played in a 36-hole competition at Kilmacolm Golf Club, Scotland, where he won his first tournament. His score of 162 strokes over 36 holes allowed him to take home first prize of £5. The following year in the 1894 Open at Royal St Georges Golf Club, in Sandwich, Vardon finished in fifth place. In 1895, the Open was played at the world renowned [[St Andrew’s Golf Club] in Scotland. While Vardon shot the lowest score in the first round, he ended up only tying for 9th place, along with his brother Tom. For the second year in a row, the title went to Vardon's friend John Henry Taylor. After the tournament, Vardon went with his brother to Royal Port Rush Golf Club. It was here the young golfer played in the first professional tournament in Ireland, and almost took home the victory before being beaten by Sandy Herd in the final round. After watching John Henry Taylor take home two consecutive titles, Vardon realized that he had to step up his game if he were to defeat the established professional. Early in 1896, he left his work in Bury to take a job at Gaton Golf Club. After his arrival, his new club arranged for a match between Vardon and the Open Championships winner, a match Harry would win 8 and 6 (leading by eight strokes with six to play). Vardon took this momentum, and his play from the two previous trips to the Open, to win the first of his record six Open Championships titles at the 1896 tournament in Muirfield, Scotland. He shot a 316 during his four rounds of play and won the title after a playoff against none other than J. H. Taylor. Vardon claimed the reason for the win was because of his great approach shots that allowed him to avoid three-putting a single green during the tournament. Soon after his major championship, Vardon became a role model for the game of Golf. His influence was no longer felt in just his hometown, but all over the golfing community as he won three Open Championships and the 1900 U.S Open over the next seven years. In 1897, he would finish sixth at the Open Championships at Hoylake, but took home first at several events, including tournaments at Carnoustie Golf Club, Ely Golf Club, and Windermere Golf Club. The next two years, Vardon would win the 1898 and 1899 [The Open Championship|Open Championships]] at Preswick, and Royal St. Georges. After this win in 1899, Albert G. Spalding, a famous manufacturer of golf equipment, named its new ball the "Vardon Flyer." In 1900, Harry made the decision to golf in America, and sailed over to the United States in January. While in the states, he played in more than 80 exhibition matches all over the country. During his trip he was paid to endorse Spalding products for $5,000, and also made a side profit advertising golf goats and muscle balm. Vardon returned to England for two weeks to play in the Open, finishing in second to J H Taylor. He then traveled back to America to compete in and win the [[U.S Open (Golf)| U.S Open] at the Wheaton Golf Club in Illnios. The victory made him the first Englishman to win both tournaments. The next year, he became one of the founding members of the PGA Tour, and finished second to James Braid in the 1902 [[The Open Championship|Open Championship] in Muirfield, Scotland. In the same year, he contracted the rare disease tuberculosis. After bouncing back from his second place finish the year before to win the 1903 [[The Open Championship|Open Championship], the brilliant golfer entered a dreadful slump. Some of his biggest critics said that Vardon entered his slump because he left his game in America, but the truth behind the slump was because of something else—putting jitters. While for a period of time there were many rumblings for the reason of the slump, Vardon eventually admitted that it was indeed his nerves on the putting surface that affected his game: "His confidence on the green was shaken…He got to the point that he felt a cold chill every time he walked up to a short putt. He did not mind the 5- and 6- footers. He dreaded putts of 2- and 3-feet. Even in his later years, Vardon said he lost little or none of his power off the tee and none of this steadiness with his irons. Yet his confidence on the green was shattered, resulting in failure after failure." The phenomenal golfer bounced back to win his country's open in 1911, at Sandwich and again in 1914, at Preswick, where he beat [J.H. Taylor]] by three strokes. He also returned to the states to compete in the 1913 U.S Open, tying for first with Francis Ouimet and Ted Ray. Although he ended up losing to Ouimet, an American ex-caddy, it was a brilliant effort by the "Grand Old Man" of British Golf. Vardon won his last major in 1914, but continued to play the game until he retired from the game, after the 1926 Open. Over the last 12 years of his career, he had a large number of impressive accolades, including: A 2nd place finish at the U.S Open during his 3rd trip to the states in 1920, and winning the Prince of Wales, News of the World medals. After his final trip to America, he returned home to warn his fellow Britains that America was starting to become a golf powerhouse. "The yanks were a zestful, enthusiastic lot and John Bull would be wise to keep his trophy cabinet tightly locked." Over his career, many viewed Vardon's swing as a model of beauty. He had tremendous power off the tee, and would turn par 5s into par 4s with his power advantage. While his swing changed the golfing view of many, no part of Vardon's game had a bigger impact that his grip. When Vardon changed his grip to the overlapping style, he had no idea that it would become the grip of 70 percent of modern golfers. In the Vardon grip, one places the little finger of the trailing hand (the one placed lower on the club—right hand for a right-handed player) in between the index and middle finger on the lead hand (the hand that is higher on the club). The lead-hand thumb should fit in the lifeline of the trailing hand. Because of his reputation and his tremendous fundamentals, Vardon wrote several books on the game including a series that started in 1912 called, How to Play Golf. In addition to the series, he wrote several others, such as Progressive Golf, and My Golfing Life. Despite having a busy schedule on the course, Vardon loved to design golf courses. In 1910, he designed five new courses: Sandy Lodge Golf Course, London, England; Copt Heath Golf Course, Solihull, England; Abersoch Golf Course, Gwynedd, Wales; Aberrstwyth Golf Course, Dyfed, Wales; [[Consett and District Golf Course, Co. Durham, England. Harry Vardon passed away on the March 20, 1937, and is laid to rest at St. Andrews Church, in Totteridge, Hertfordshire, England. Harry Vardon had a great effect on the game of golf from all areas. He won six Open Championships on his own soil, and became the first British golfer to win the U.S Open when he took the title in 1900. After his death, the PGA of America created the Vardon Trophy. It is awarded annually to the player on the PGA Tour with the year's lowest adjusted scoring average. Vardon was also a great teacher of the game, as he went on to write books on the game's strategy up until his death in 1937. His grip, the overlapping grip, is the one used by the overwhelming major of professional and amateur golfers alike. He was a great champion and a gentleman who despite his fame, always had a passion for helping others. Harry Vardon was a private and modest individual. 1898 The Open Championship (2) 2 shot deficit (307) 1 stroke Willie Park, Jnr. ↑ Golf: It's History, People, and Events. ↑ Harry Vardon International, Timeline. Retrieved October 24, 2007. Adapted from the article Harry Vardon, from Wikinfo, licensed under the GNU Free Documentation License. This page was last modified on 9 August 2016, at 15:50.